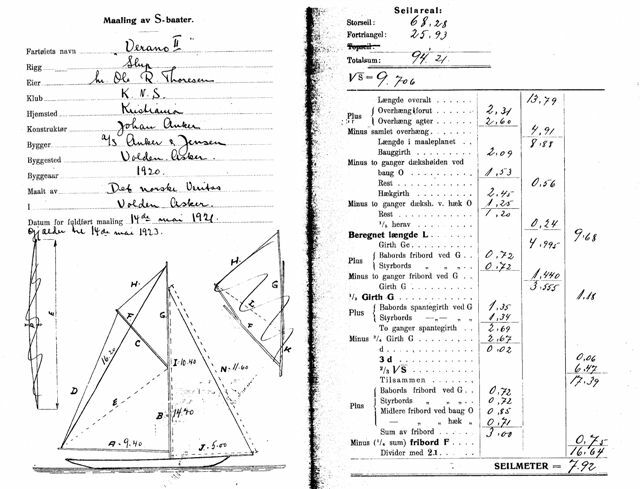 In 1921 the 8mS yachts goes back and races in their own class, go to end of section "Rules History - R rule 1919"
Shipowner Ole R. Thoresen acquires "Verano II" from Eilert Sundt and certifies her in 1921 to the 8mS-Class. Measurement Certificate dated May 14th 1921. For some reason (to be discussed?) it seems she in 1921 is not given the right to race in the 8mS Class. Why? Comparing the S-certificate of Anker & Jensen yard no 223, "Verano II" dated May 14th 1921 with the S-certificate of Anker & Jensen yard no 220, "Betty III" dated May 16th 1919 shows no major discrepancy in measurement points not complying with the S-rule of 1917. Although yard no 220 and 223 both are laid down in accordance with the same drawing Johan Anker's habit was to make minor field adjustments, always seeking for improvements. Any modifying of yard no 223 from S to new international R, questioning her right to race in the S-Class, would have been made outside the measurement points? In the S-rule of 1917 there is in the girth measurement G made certain restrictions, as included in section Appendix http://snarken.page.tl/S_1917-articles.htm . In general max girth should be measured at the position with max G, and if equal the position with the largest beam should be choosen. 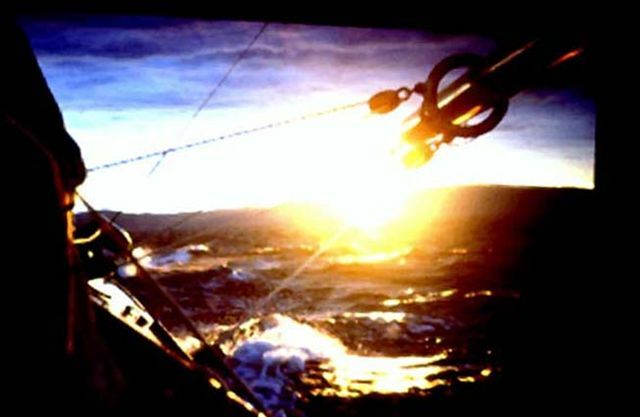 However, the girth may be measured in any point aft 55% subject to the underneath of the keel behind the measurement point has a straight line, and that the sum of girth and beam (G+B) in any point aft the girth measurement position does not exceed the sum in the measurement position. In the R-rule of 1919 this is simpilified such as girth G is to be measured in the 55% point giving more flexibility on beam and depth aft the measurement point, which again resulted in extreme sloping keels and max depth restriction. It would not be unlike Johan Anker when modifying yard no 223 to new international to make a first step by increasing the beam outside the 55% G measurement point. If this affected the sum of G + B aft the 55% position can easily be checked. If so this based upon her speed performance during racing the other converted S-yachts in 1920, could be the reason why she in 1921 was not permitted to race in the S-Class? The max depth does not differe (1.70m), neither do her max beam (2.45m) nor G, so any change in shape has to be in increased beam around cockpit area and possible around mast area, which unlikely would affect her displacement nor weight of bled keel, in any significant amount. 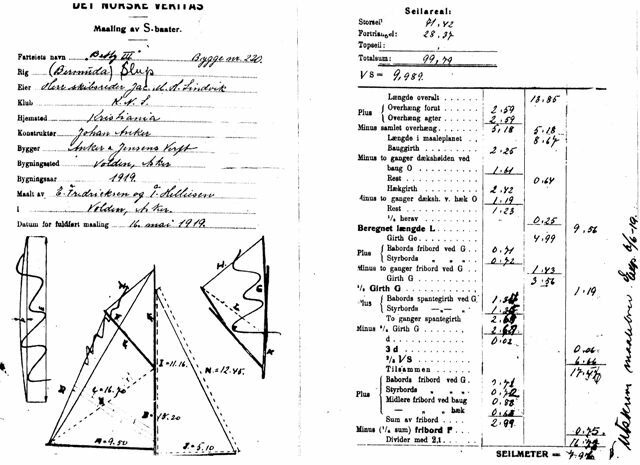 "Verano II", R-1919 certificate from June 2nd 1920 is still valid in 1921, and she is sold by Ole R Thoresen to to Nicolai Andresen jr who names her "Siva", sail no 8 N11. In 1922-1923 she is owned by Dagfinn Paust, named "Danseuse" http://snarken.page.tl/Dagfinn-Paust.htm Her international R (1919) - certicate is renewed June 1st 1922 made valid for another 2 years. Ole R. Thoresen resumes ownership of "Danseuse", ex "Siva", ex "Verano II" and names her "Fandango II". In KNS register 1923-24 "Fandango II", ex "Danseuse", ex "Siva", ex "Verano II" is listed in the International 8mR First Class of 1907 with owner Ole R. Thoresen, Kristiania (Oslo). 8mR (First Rule Class) H11 "Sans Atout" which in 1920 had been certified as new international given sail racing no. 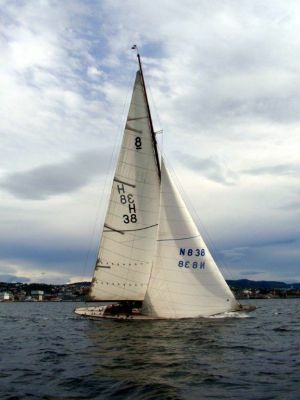 8 N16 with owner Stene, Fredrikstad has returned to the 8mR First Rule Class with owner Sam Bull, who later become owner of "Fandango II" named "Idyll III" (go to Sam Bull). The 8mR First Rule 1907 yachts when racing the S-yachts had to give the S-Eights a handicap of 12 sec pr nautical mile in wind less than 5m/sec, this due to the R(1907) yachts larger sail area. The handicap could be the reason why the modified Anker & Jensen yard no 223 in 1923-24 is listed together with the First Rule R-yachts. For sure she was an international R-yacht. Another reason why she was listed with the R First Rule 1907 Class may have been that she was laid down in 1919 before the 2nd R-rule came in force, and she was commissioned in 1920 as R-International. Most of the 8mR(old) yachts were during the early 1920-ties converted with Bermuda sail plans. In 1924 the 8mR(old) Class and the 8mS Class are racing as one class without handicap and in future registers she is listed in the combined R-1907 and S-1917 Class .